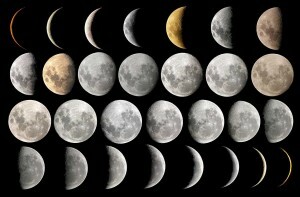 The phases of the moon- The moon of the 13th night ( Ju-sanya) is in the second row, the second from the right- just count from the top! These days, when most Japanese think of O-Tsukimi (お月見- moon-viewing）they imagine admiring and making offerings ( of seasonal foods and grasses) to the full moon of mid-autumn, the biggest looking and most beautiful moon of the year, which appears on the 15th night of the 8th month of the old lunar calendar ( which was in September). Since according to that calendar the full moon almost always occurs on the 15th of the month, besides the word MANGETSU ( 満月), which literally means FULL MOON, there is another expression- JU-GOYA (十五夜), directly translatable as THE 15th NIGHT, which in the past could be used to indicate any full moon, but which now is usually taken to mean the night of mid-autumn moon viewing. The custom of having formal events on the night of the 15th in the 8th month was introduced to Japan from China, though as it spread throughout the land it was JAPANIZED, in that the offerings made to the moon also came to include TARO (yama imo), and other native Japanese species. However, what really made Japanese O-Tsukimi distinctly different from what (still) happens in China is the fact that in Japan, proper moon-viewing could not be completed on JUST ONE NIGHT (the 15th night of the 8th month). This was called KATAMI-TSUKI (片見月), and was considered to be highly inauspicious. To do TSUKI-MI the right way in Japan, one had to also set offerings to, and then admire the moon again approximately one month later, in the 9th month.This time it was not the full moon of the 15th night which received special attention, but the moon of the 13th night (JU-SANYA 十三夜), which is very large , but NOT QUITE FULL (see the chart above). It is said that this IMPERFECT moon, appeals more strongly to Japanese (as oppossed to Chinese) aesthetic sensibilities. The shape of the moon on the 13th night might also have been considered significant since it is on the 13th night of the 7th month ( the beginning of the O-Bon festival) that the Japanese believed that the spirits of their ancestors would return to this world for a few days. Tonight, the night of October 20th,2010) just happens to be the 13th night of the 9th month according to the old calendar, and thus across the country, many families will be preparing special foods and decorations for tonight`s TSUKIMI.In particular soy beans and chestnuts are important. In fact, nicknames for JU-SANYA are MAME MEIGETSU (豆名月ー BEAN-MOON) and KURI-MEIGETSU (栗名月ーCHESTNUT-MOON). Whenever I hear the expression JU-SANYA, the short story of the name name by HIGUCHI ICHIYO ( of 5000 yen bill fame). It is her tale of a woman, who by marriage to a man of higher status can give security and pride to her parents and also give birth to a son she adores- yet REMAINS MISERABLE because of the way her husband treats her, that I came to understand the symbolism and significance of the 13th night moon. It is on that night that she secretly escapes from her home intending to leave her husband and son forever and return to her parents house. In the end they convince her to return to husband and endure her unhappiness for the sake of her husand, on and themselves. At first I could NOT understand why HIGUCHI ICHIYO connected this womans situation with the moon ofthe 13th night, but then it hit me- NOTHING IS PERFECT and YOU CANT HAVE EVERYTHING. Tonight`s moon is a symbol of the imposibility of perfection- especially human happiness. Still looking at the beautiful moon on a fragrant autumn night can fill us ( for a fleeting moment) with a sense of awe and wonder. Go on out tonight and have good long look. The Tori no Ichi (酉の市) Rooster Day Fairs- A closer look at one of the Kanto Regions most exciting events of November! This year on the 7th and 19th of the month. It’ pity we cannot enjoy full moon tonight around cloudy Tsukuba area. But two or three night before we have enjoyed almost full moon. Next time when I could have 5000 Yen banknote, I would like to tell Miss Higuchi Ichiyo that I was recently able to know the reason why she used the subject “13-Ya” for her famous novel by the article of an Newyorker-gentleman of sound intelligence. Also I must confess her that I have known her name and life because she was so famous but I never read her few novels written in 14 months when she was 24-25years old in 1890s. Near future I would like to try for the sake of my precious 5000-Yen note. Thanks Avi-san of your presentation. Hello. I could enjoy my Otsukimi despite a cloudy night. We could see the shape of the moon from behind of the clouds. We call that oborozuki which means the moon shining through the thin clouds. Very nice and lovely.